For years Robert has been a lumberjack athlete; throwing axes, chopping & sawing wood, speed climbing, and log rolling. He has performed across North America, Australia, and New Zealand. 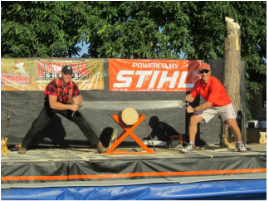 He is a 2 time Lumberjack World Championships competitor. Retired from lumberjack sports he now solely focuses on arboriculture. He is active in ISA Tree Climbing Competitions across North America. He has also worked as a climbing arborist in Norway and across the Pacific Northwest with some of the top climbers in the world. He enjoys rock climbing and competing in local ski and mountain bike races. He has skied the Birkie numerous times and in 2019 volunteered as a forerunner and skied the course at 4 am on race day! He has a Business Degree from Bethel University (St. Paul, MN), is an ISA Certified Arborist & Climbing Specialist, and a lifelong student of arboriculture.